UltraShape Reviews - Is it a Scam or Legit? Ultrashape body contouring can help eliminate fat from the tummy, thighs and other areas without going under the knife. Read about its safety, cost and effectiveness. There’s a big buzz around body contouring treatments that claim to reduce fat in various parts of the body – without going under the knife. This article takes a look at a body contouring method called Ultrashape, a non-surgical treatment that involves the use of pulsed, focused ultrasound to eliminate fat cells – without pain or downtime, according to experts. We’ve gathered input from a board-certified plastic surgeon and board-certified dermatologist, as well as the U.S. Food and Drug Administration, to provide you with as much information as possible so you can decide if Ultrashape is right for you. Keep in mind that this article is not intended as medical advice. Before you decide to undergo Ultrashape, it’s important to talk to your medical professional first. Let’s begin with discussing what Ultrashape is, how it works and what it’s used for. Later on, we’ll address other important factors, including the number of treatments needed to see results and how much Ultrashape costs – as well as the potential side effects. Ultrashape uses focused ultrasound waves to affect the water between the fat cells, explained Dr. Ted Lain, a board-certified dermatologist and Chief Medical Officer at Sanova Dermatology in Austin, Texas. In full disclosure, Dr. Lain does not own an Ultrashape machine, and has never seen a procedure using this technology. Rather, his expertise is based on his review of the medical literature about Ultrashape. Dr. Yuly Gorodisky, who is board-certified by the American Osteopathic Board of Surgery, describes Ultrashape as a device that helps to break down fat deposits using energy from focused ultrasound. “The new generation of Ultrashape Power, which is updated, is more effective than the original,” said Dr. Gorodisky, owner of the West Coast Plastic Surgery Center in Southern California. The Ultrashape Power machine uses HD video to identify the area marked for treatment and creates a treatment grid that the technician uses to apply ultrasound pulses, he said. “The pulses are completely painless but as they accumulate in the area treated, they cause destruction of the fat cells under the skin,” Dr. Gorodisky noted. After the treatment is complete, the fat is released from the ruptured fat cells and they are cleared out by the body’s natural elimination mechanisms. What is Ultrashape used for? Ultrashape is mainly used on areas that are relatively flat such as the abdomen and outer thighs, according to Dr. Gorodisky. It can be used to reduce fat in the tummy, thighs, flanks, hips and arms – and even male chests. Ultrashape is used for subcutaneous fat reduction in both small and large areas, Dr. Lain said. It is important to differentiate the types of abdominal fat, Dr. Lain noted. Subcutaneous fat is that which is located between the skin and abdominal muscles, while visceral fat surrounds organs, located beneath the abdominal muscles. “This technology, like all other fat reduction devices, reduces only subcutaneous fat, highlighting the importance of the laser technician or physician's role in determining whether someone is a candidate for the treatment,” Dr. Lain said. Overall, Ultrashape is considered effective, which we cover in the next section. Ultrashape Power, the next generation of the Ultrashape device, is effective in reducing the fat deposits by about 32% in studies, according to Dr. Gorodisky. “For best results, the aftercare instructions should be followed closely,” Dr. Gorodisky advised. Ultrashape Power uses radiofrequency to permanently destroy the fat, said Dr. Sandy Johnson, who is certified by the American Board of Dermatology, and is the owner of Johnson Dermatology, one of one of the most comprehensive laser centers in Arkansas. Dr. Johnson chooses Ultrashape Power over another body contouring treatment called Coolsculpting, which freezes the fat. 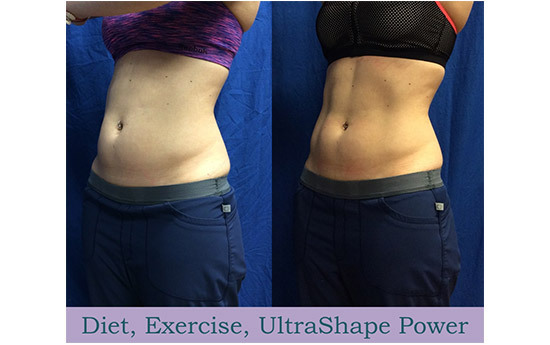 “When we researched, we chose Ultrashape Power over Coolsculpting – the results are more natural and smooth and various other benefits,” Dr. Johnson said. In a blog Dr. Johnson wrote comparing different body shaping devices, she includes a chart that compares Ultrashape and Coolsculpting. Those who underwent Ultrashape showed a 32% fat reduction, compared to a 20 to 25% fat reduction with Coolsculpting. The discomfort level for Ultrashape was “none,” compared to “possible bruising, swelling or tenderness up to 8 weeks” for Coolsculpting. Dr. Lain noted a single center study that was performed evaluating the latest iteration of the technology, Ultrashape Power, on 43 patients for their abdominal subcutaneous fat – also known as tummy fat. According to the study, the subcutaneous fat layer thickness was precisely measured using ultrasound evaluation at points prior to the treatment, and every two weeks started at the second treatment until 12 weeks after the third treatment. These results are impressive – but are tempered by the patient satisfaction data, Dr. Lain said. When patients were asked to rate their improvement on a 5-point scale (0=no improvement, 4=highly significant improvement), 60% of patients chose a rating of either 0 (no improvement), or 1 (mild improvement). With any clinical treatment, it’s important to consider the safety factors, which we discuss next. Treatment with the UltraShape Power demonstrated a positive safety profile, with no adverse events, according to the Food and Drug Administration’s report on Syneron’s UltraShape Power System. Additional safety data from a prospective clinical study of 21 patients further confirm the safety profile of the device. Subjects underwent 3 treatment sessions each 2 weeks apart; follow-up visits occurred at 2, 4, 8 and 12 weeks after the last treatment visit. The study results further supported the safety profile of device treatment with only one minor event from which the patient completely recovered without the need for any intervention. Subjects reported minimal discomfort and overall satisfaction with the treatments. Therefore, performance data demonstrated the safety and effectiveness profile of the UltraShape Power for its intended use. Now that we’ve addressed the safety and effectiveness of Ultrashape, the next section explains what a treatment would involve at Dr. Gorodisky’s practice in Southern California, to give you an example of what to expect. What can I expect from an Ultrashape treatment? At Dr. Gorodisky’s practice, the treated area is mapped out by professionals, photos are taken, and the areas are measured. The then patient lies on a treatment table and the area of fat is covered with a water-based ultrasound gel. The ultrasound transducer is placed on the skin, and using a computer-generated treatment grid, the area is covered completely with painless pulses of gentle ultrasound. There is no pain felt with the treatment. After the appropriate number of ultrasound pulses are delivered, the treatment is completed and the patient is ready to go back to their normal level of activity with absolutely no restrictions. There are no garments to wear, there is no pain, and there are no signs of treatment. The patient is scheduled to return back for another treatment in two weeks, and another one two weeks after that. Finally, after about four weeks of the last treatment the patient is back for their evaluation and photographs. With this treatment protocol, most patients experience about 32% reduction in the fat deposits in the area treated. The treatment may be repeated to reduce the fat content even more. Before you decide to spend money on Ultrashape, it’s important to consider the costs, as well as the number of treatments needed, which we discuss in the next section. In Dr. Gorodisky’s practice, the cost depends on the size of the areas treated. Small areas start at $300 and larger areas can range to about $3,000. The treatment includes a series of three sessions, two weeks apart. The most common treatment regimen is three treatments, two weeks apart, agreed Dr. Lain. “The clinical trials show that while some see results as early as two weeks, the results continue to improve to 12 weeks after the last treatment,” Dr. Lain said. According to Epione, a laser and aesthetic surgery center in Beverly Hills, somewhere between $900 and $1,200 is what the average Ultrashape price should be for most patients to expect. More often than not, most patients will opt for at least three treatments to achieve those results they desire. While Ultrashape is considered safe, there can be possible side effects, which we cover in the next section. What are the potential side effects of Ultrashape? The patients who undergo the treatment should not be pregnant or breastfeeding and should not have any significant liver problems, Dr. Gorodisky warned. “Otherwise, the treatment is very safe,” he said. This procedure is considered “entirely non-invasive and perfectly safe” – and during and after the procedure, patients will usually suffer no pains, according to Epione, a laser and aesthetic surgery center in Beverly Hills. During the procedure, some patients have reported a tingling sensation, “but nothing too bothersome to be handled by them,” Epione noted. Others have reported in-office some mild discomfort after treatment, or slight skin redness. Reports of skin irritation and bruising are far less frequently reported – and usually, without needing any additional medication, these symptoms tend to disappear in one or two days. Unlike other fat reduction technologies which focus on the use of heat (radiofrequency) or cold (cryolipolysis), Ultrashape produces little to no temperature change, Dr. Lain noted. “Patient comfort levels are very high during and after the treatment, and this is most likely related to maintenance of a stable temperature during treatment,” Dr. Lain said. Do drink plenty of water before and after the treatment. Do exercise and eat healthy after the treatment. Don’t drink alcohol and avoid fatty meals while undergoing the treatment. It’s important to avoid unrealistic expectations from Ultrashape, Dr. Gorodisky advised. “Although effective, patients need to be close to their normal weight and healthy to undergo this treatment,” he said. Ultrashape treatments are a non-invasive way to reduce fat – however, it is not a replacement for weight loss, a healthy diet, and exercise, Dr. Gorodisky further emphasized. According to Dr. Johnson, it’s ideal for people with stubborn fat, or genetically acquired problem areas that maintain a healthy lifestyle with diet and exercise. “In other words this isn’t for weight loss, be at your goal weight then treat for contouring into the shape you desire,” Dr. Johnson said. 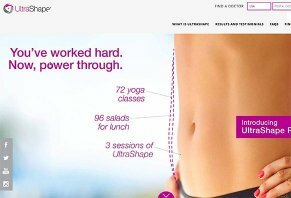 Write a Review for UltraShape!